R. O. Kwon’s debut novel The Incendiaries had built up considerable anticipation and buzz before its publication on July 31. In part, this was due to superb marketing, on both the publisher’s and the author’s part (Kwon is a whiz at social media and networking). For the most part, though, it was due to the novel itself, which is arrestingly good. 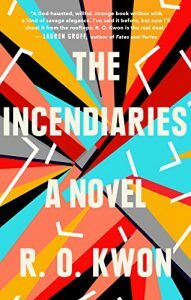 R. O. Kwon’s The Incendiaries is a superb debut novel. I had the considerable good fortune to participate in a fiction workshop led by Reese Kwon earlier this year. Kwon is an engaging instructor, as one would expect. She was also generous enough to share several asides about the 10-year gestation period of her novel, such as the fact that she spent the first two of those years compulsively reworking the opening 20 pages. Kwon is on record as being absorbed by language at the molecular, syllabic level—she is acutely attuned to sound and rhythm, and to how these serve meaning. I suspect her original intention was for nearly every sentence in her novel to stand alone as poetry, and in fact many of these sentences survive in the published version. She is a beautiful writer. The plot opens with a bang, deliberately so. The rest of the book is then given over to an exploration of the elements and events leading up to the terrorist blast. This in accomplished by interweaving vignettes from the point of view of the three principal characters, always in the same sequence: Will, a student at a leading Hudson Valley college, John Leal, a cult leader with a mysterious past seemingly tied to North Korea, and Phoebe, Will’s sometime girlfriend. Will’s point-of-view is the dominant one, because he is deliberately trying to achieve a coherent and comprehensive explanation for the events that take place. Will wants meaning. But no such explanation, at least with the comprehension Will desires, can be reached. Its absence does nothing to impede the interest generated by the novel’s characters, though, and indeed the absence of “complete” answers for all complex human affairs seems to be part of the novel’s message. Loss of faith is the major theme here. There can be no all-encompassing answers, ever. The Incendiaries has one of the finest, most beautifully rendered endings I’ve read in quite some time. I’d quote it for you, or at least a portion of it, but I’d much prefer you read this short novel in its entirety instead. Highly recommended.